Take the main A30 in the direction of Penzance until you come to the village of Crowlas. At the crossroads in Crowlas you turn right and follow the sign to Ludgvan. Crossroads garage is immediately on your left and then Ludgvan School. Continue on the road until you come to the next right turn this is Blowing House Hill please turn right (immediately opposite this turning is a postbox in the wall). Keep on this road for about 3/4 of a mile and we are situated on the left hand side. When you see the green Trevine sign turn left, you are now at Scilly Parking. The address is Trevine, Blowing House Hill, Ludgvan, Penzance, Cornwall. If you are on a 9.15 am sailing you need to be with us by 8am. 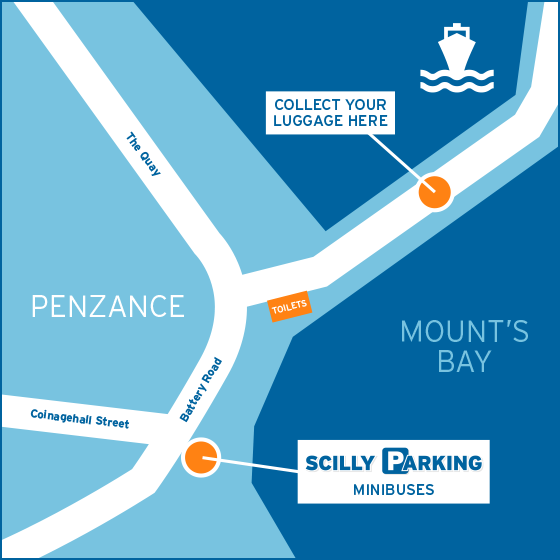 We drop you off and pick you up at the end of Penzance Quay or 50 metres along the pavement to your left as you leave the quay. Look out for the Scilly Parking minibuses & our hi-vis jackets.